What is the standard by which you measure yacht quality? Where do you set the bar when it comes to performance? What is your Gold Standard? As a professional full-time delivery captain, I have had the opportunity and pleasure of running some of the best designed and built motoryachts on the planet. What’s more, many of my favorite yachts are all designed by the same Pacific Northwest legend, Bainbridge Island-based Ed Monk Jr. Of the 157,000 nautical miles I have logged as a long-range motoryacht delivery captain, 55,000 of those miles are in vessels designed by Ed Monk Jr. We of the Pacific Northwest can boast of a long line of very well-designed and very well-built boats that share the common heritage of Ed Monk Jr: Tollycraft, McQueen, Nordlund, Christensen, and Westport among them. His designs have gotten me through a variety of intense situations, drawn here from my log: May 1996. Northbound in Puget Sound. I just left Shilshole with an Ocean Alexander 456 Cockpit Motoryacht. I am on day one of a three-day trip around to Portland, Oregon. The wind is out of the north at 25 knots pushing a three-foot chop with occasional fours. June 1998. Southbound between Point Arena and Bodega Bay, California. I am in a 65-foot Tollycraft Cockpit Motoryacht. The wind from Point Arena to Point Reyes was forecast to be northwest 10 to 15 knots. Because of the not-forecasted cape effect, within the first five miles the wind goes from 10 knots to 30 plus pushing a short period of a six- to eight foot following sea. August 2005. Northbound off Gold Beach, Oregon. I am running a 43-foot Tollycraft aft cabin from Alameda, California to Anacortes, Washington. The wind is out of the northwest at 15 knots, gusting to 20. I beat into a two-foot chop with occasional threes. May 2010. Southbound between Cape Flattery and Cape Alava, Washington Coast. There is a 10-foot swell from the west at nine seconds with a two- to three-foot chop on top from a northwesterly wind at 15 knots. I left Neah Bay early that morning in a 54-foot Ocean Alexander Trawler after waiting two days for the weather to calm down. April 2015. Northbound off Cape Mendocino, California. I am four weeks into a delivery from La Paz, Mexico to Seattle, Washington. I am just three miles off the beach trying to stay inside the north wind which had been blowing for the past week. I was taking advantage of a 24-hour window where the higher winds had moved a bit further offshore leaving a leftover three- to fi ve-foot chop at eight seconds. My vessel? An 80-foot Nordlund. December 2015. Colon Panama to Isla Mujeres, Mexico. Distance 825 nautical miles. I have been waiting on the Caribbean side of the Canal for ten days for the northeast trade winds to subside. I am running a 78 Ocean Alexander from Seattle, Washington to Fort Lauderdale, Florida. This vessel carries 2,000 gallons of fuel and burns 1.7 gallons per mile at 10 knots. I plan to arrive in Isla Mujeres with no less than 600 gallons on board. Running at 9.5 knots will ensure I stay within that limit. I depart at 0800 hours with a planned arrival approximately three days later mid-afternoon. The winds have been blowing from the northeast at 20 to 30 knots for over a week, pushing a six- to eight-foot chop. Finally, they drop to 10 knots. We depart with light wind, but with a leftover shorter period five-foot swell on the starboard beam. Running at 9.5 knots, the vessel easily negotiates these conditions for the next 24 hours until we turn more towards the northwest where we put more sea behind us. In each of the cases I previously mentioned, I am running at approximately 10 knots and burning between 1.5 and 1.7 gallons per mile. I am enjoying a relatively comfortable ride that enables me to stand unsupported at the helm, arms crossed, gazing respectfully out at the open sea ahead of me. In the motoryacht world, from about 60 feet length overall and up, 1.5 gallons per mile at 10 knots is about as good as it gets. The yachts from my anecdotes have different sizes, manufacturers, and styles pitted against completely different sea conditions and locations. But all are designed by Ed Monk Jr. In 1977, Alex Chueh of Taiwan teamed up with Ed Monk Jr. to create Ocean Alexander, now known as Alexander Marine. To this day, Alexander Marine is the only production boat builder still building Ed Monk Jr.-designed motoryachts. It was on an Ocean Alexander that I first was introduced to the design of Ed Monk Jr. and I consider myself very fortunate that the majority of my deliveries to this day are on Ocean Alexanders. My first introduction to Ed Monk Jr.-designed vessels was back in the mid- 1990s. In 1996, I was out of the Coast Guard for five years and had a couple of full-time yacht jobs plus a couple of commercial gigs under my belt. I started running Ocean Alexanders for the Seattle dealer between their stores in Seattle and Portland, Oregon. After the first few minutes of the first trip, I learned and began to appreciate the virtues of good hull design. I became a disciple of Ed Monk Jr.
From my years in the U.S. Coast Guard, as a corporate pilot, and now as a long-range delivery captain, I come from cultures of safety and reliability built on a foundation of good design, engineering, construction performance, and seakeeping. I also had the opportunity to run a great number of different vessels from a variety of builders in the offshore environment: steel, aluminum, wood, and fiberglass; large and small; multi- and mono-hull; one engine and two. I’ve experienced engineering and construction that is rock solid and also piloted builds that leave me scratching my head asking, ‘What were they thinking?’ Boats are not created equal. Out of all these characteristics and hundreds of combinations, it is design that will dictate what you will end up with. It is design that will separate the good from the bad and design is the first and most important element upon which a boat is built. Start with a poor design with great engineering and construction, and you will still have a poorly-designed vessel in the end. Number one on my list and the vessel by which I compare all others is the 65 Tollycraft Cockpit Motoryacht. For me, the 65 Tolly embodies the best combination of design, engineering, construction, performance, and seakeeping. There is no mistaking the look of an Ed Monk Jr. hull design with the fine entry of the bow and classic lines. The look of the 65 Tollycraft is the epitome of his style and a heritage that is shared by every vessel that started life on his drawing board. Fuel economy/performance and seakeeping are the most important elements that I deal with. The average leg on a typical West Coast delivery can run from 240 to 480 nautical miles. On a coast-to-coast trip through the Panama Canal, I can see legs up to 800 nautical miles. The average motoryacht does not carry a lot of fuel and doing these legs efficiently at 10 knots in relative comfort is extremely important (especially for someone who makes a living doing it). When I consider any vessel for a delivery, my first thoughts go to the overall design and construction of that vessel. How heavily is she built? What are her seakeeping characteristics? What speed will I be able to cruise her at? From there I will develop a set of limits by which I determine the weather conditions I pick for the trip. The lighter the vessel and corresponding seakeeping characteristics, the better the weather I need. Next, I will look at what her fuel capacity and expected fuel burn is for the planned 10 knots I hope to run. There is little correlation between the weight of the vessel and her fuel burn, rather fuel efficiency comes down to hull design. For example, take two 65 footers side-by-side that have the same length, engine power, and basic weight, but different hull designs. The better hull design will be up to 20 percent more fuel efficient at the same speed. I have run very lightly built vessels that have had poor hull designs with lousy fuel consumption. I have a deep-seated appreciation and respect for the beauty and power of the sea. I endeavor to work with her, not against her, and strive to pick the best of her weather for my clients and my journeys. Ed Monk Jr. designs boats that seem to flow as easily through the water as well as with the sea. Design is the foundation upon which all vessels are built, and when it comes to performance and seakeeping, Ed Monk Jr. designs are my Gold Standard. Captain Chris Couch is a successful Pacific Northwest-based delivery captain who has been widely used by companies like Alexander Marine for the last 26 years. Couch enjoyed a 14-year career in the U.S. Coast Guard that took him around the country to the East Coast, Gulf, and West Coast on all kinds of vessels. He has been at the helm through the Panama Canal five times and for four transpacific crossings. 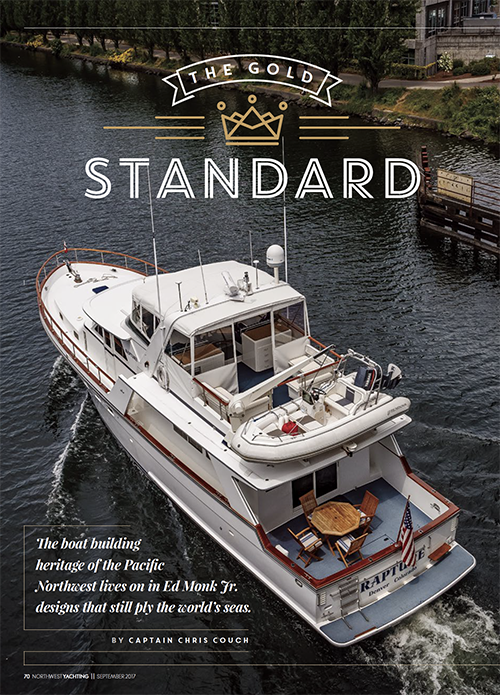 His book, The Checklist, is enjoyed by and distributed to yachts owners and is a fantastic resource that covers just about everything relevant to a PNW Boater. You can buy The Checklist, check out his other publications, or contact him at compassheadings.com.